Above image by Lutefisk Sushi Volume E featured artist Zander Cannon. Spread the word! The Lutefisk Sushi Volume E opening is this Friday! Lutefisk Sushi Volume E is a limited-edition, hand-silkscreened bento box of mini-comics created by over 35 Minnesota cartoonists (the boxes will be sold for $25 each… which is well under a buck a comic). It is the fifth set in an ongoing series started in 2004. The opening reception for the release of LSE is this Friday, November 2nd, at Altered Esthetics gallery from 7PM to 10PM. More information can be found here. I have a new mini included in the box, Freaky Tiki. Much of the original art from the mini is hanging at the gallery… any of which you can purchase for a twenty spot. #159: What Kind of Person Reads Soapy the Chicken? Hello, dear reader. Thanks! Really, thanks! 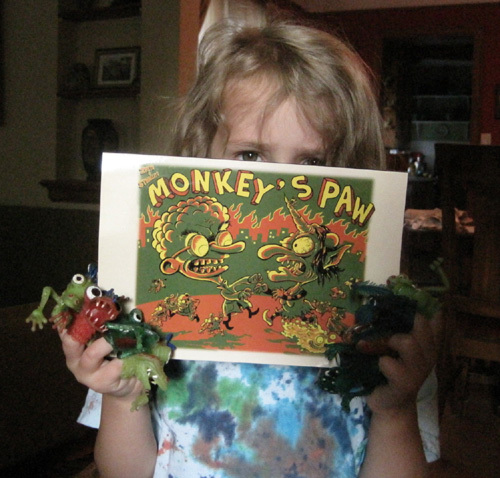 Your checking my comics out is much appreciated… I hope you are enjoying them, and that you’ll come back for more. However, I will no longer be posting Soapy the Chicken every Monday. 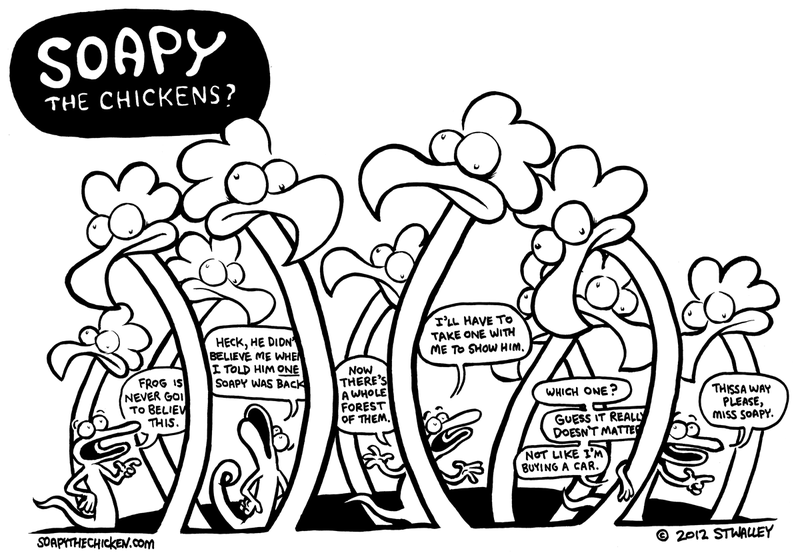 It’s hard to believe I’ve been posting Soapy the Chicken comics since 2005… this is strip #159. It sure seems like there should be more! For the last half year (since June 20th), I’ve managed to post a strip every Monday, which has been a lot of fun… and a lot of work. I’ve read it recommended a number of places that if you want to build an audience for a comic strip, post it on a regular schedule. Thus, I decided to post every Monday. I really shouldn’t look at site statistics. I guess it works for some strips, but it sure doesn’t seem to be working for this strip. 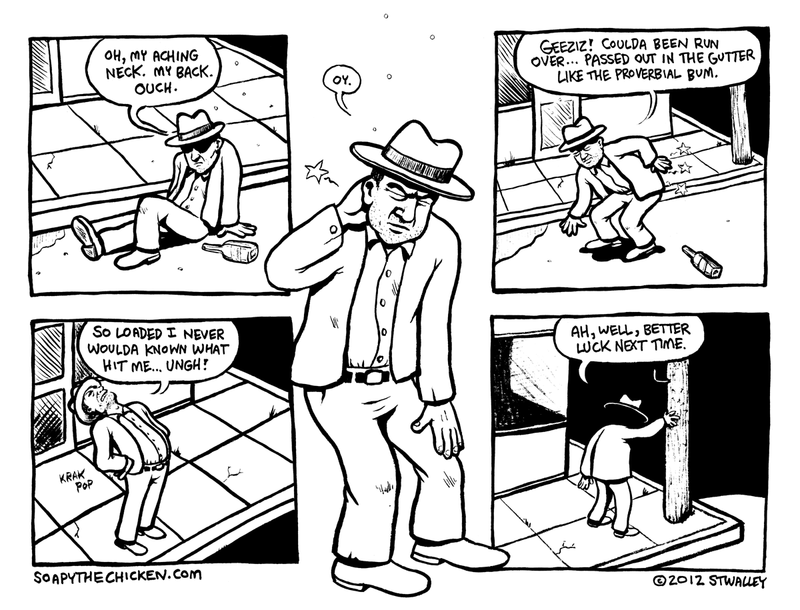 This, I’m sure, is all my fault… I haven’t spent enough time promoting the thing (I don’t have a lot of spare time), and it is not really easy to find an audience for a comic strip about a frequently-dead, mentally-challenged chicken, anyhow. I probably should have chosen something more “high-concept” for a comic strip, like, maybe a zombie chicken with an attitude on a mission or something. Fortunately, I’m really making this comic strip for my own pleasure (sorry to be selfish about it). There’s no money in it, few discernible rewards to doing it beyond my own satisfaction, and I receive almost no feedback. If no one cares that I update every Monday except me… what is the point of posting every Monday? The point was to keep doing it on a regular basis, I guess. If I had not been producing these on a schedule for the last half year, there is no way I would have made as many of them. So, I’m glad I did it. But if the schedule is not paying off in building readers, I’m going to take more time with it, and focus on some other projects as well (which, of course, will take away time I could be working on this strip). 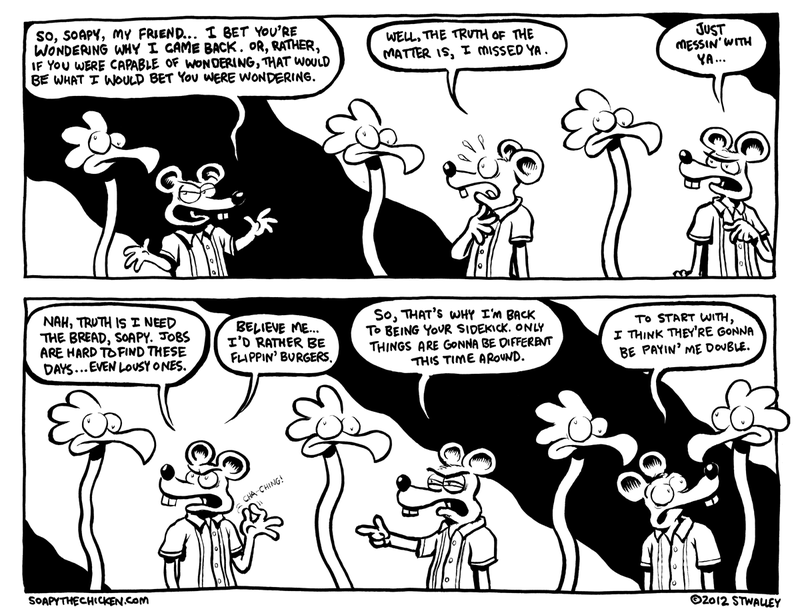 The strip will continue… but at whatever pace suits my fancy, which may be unbearably slow (or it may be tomorrow). I hope you’ll stick with me. Many of you probably won’t, and to you I say thanks for reading while you did! In the coming years while you are eagerly waiting and checking this website every hour for updates, you can keep up with whatever I’m up to online on my main website at stwallskull.com, if you’re inclined. Additionally, my webcomic collaboration with Ben Zmith, Monkey’s Paw, will continue to post every Friday for the foreseeable future. 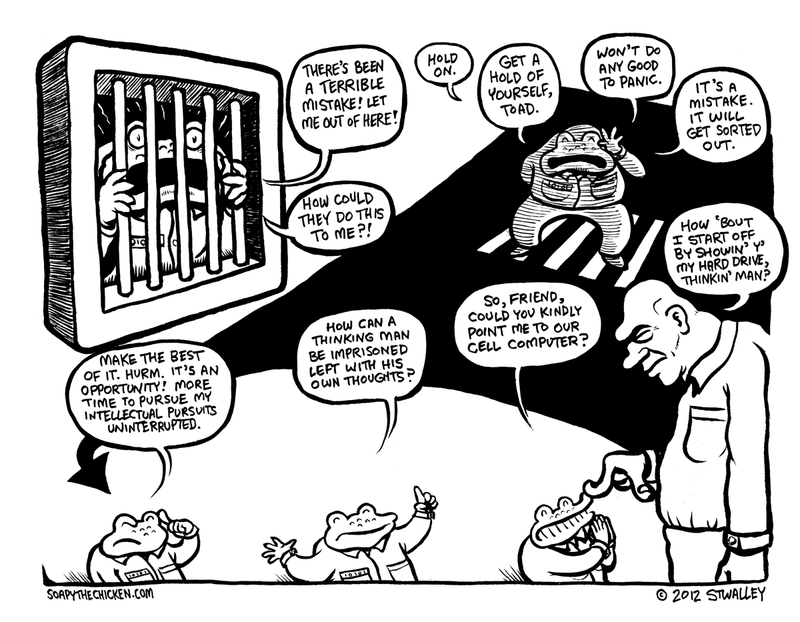 I should probably remind you that you can subscribe to this comic strip via newsreader or email, so the Soapy strips will come and attempt to demand your attention whenever they get posted. Hey, pal. Hey. I gotta get to Elk River, and, um, car broke down… radiator… I don’t have any fare for a bus. Yeah. I got a sick cousin… she needs my help. Diabetes. And gout. They’re going to have to amputate, I think. 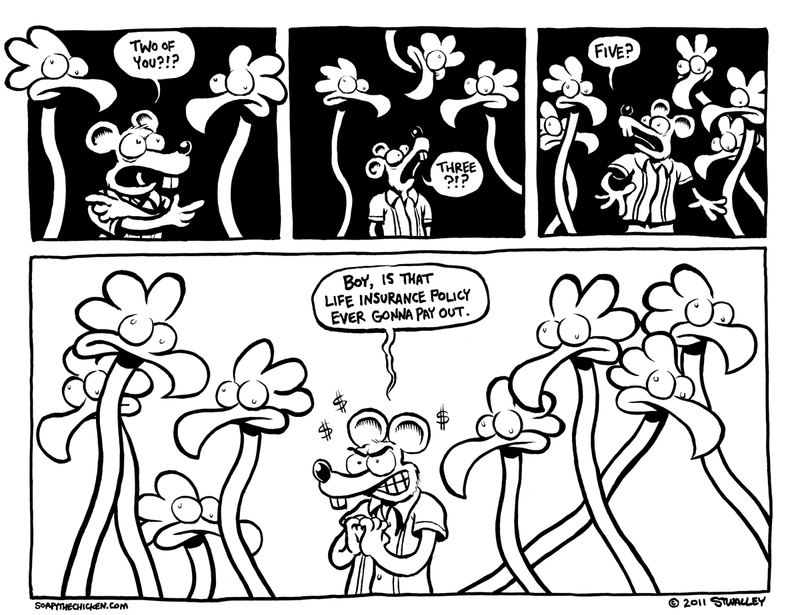 You think you could, y’ know, tell someone about this comic, huh? Thanks much for reading! You’re the best, pal! 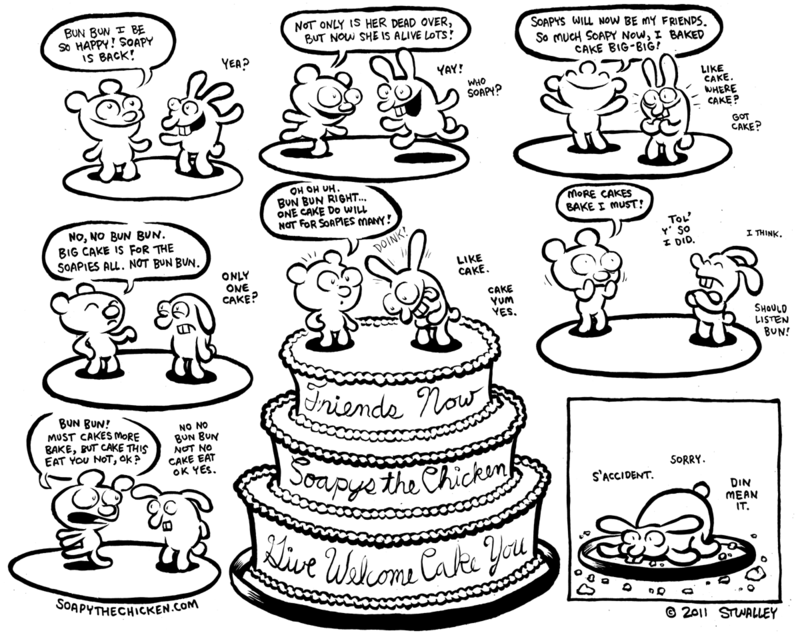 Did you know that reading comic strips about extremely stupid chickens no longer holds the same social stigmas it used to? While it still won’t get you invited to many cocktail parties, it is extremely rare that people resort to lynching your kind any more these days. You may want to consider passing around and sharing these strips with others… the greater your numbers, the less chance there is of you being individually singled out. If you’re inclined to share this with a friend or two, it is always much appreciated. Whew! Made my self-imposed deadline with a few minutes to spare. Happy holidays. Sorry no cake.